Alive and Young: Saint John Coltrane of San Francisco, Pray Play for Us. 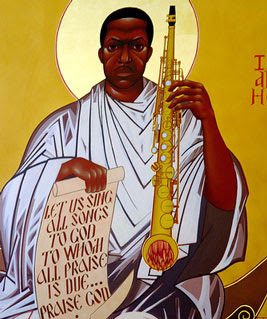 Saint John Coltrane of San Francisco, Pray Play for Us. Saint John Coltrane Church of San Francisco My Jazz improve professor once told me about this place. I can't help but laugh out loud when I see this. I wonder if they have a Miles Davis Mission? I'm no expert, but I don't think the Catholic Church will be adding him to the litany of saints any time sooon. Be sure to check out the icons. I have to smile too. Wonder why John Contrane? The Church is serious about its unusual liturgy, and its mission to help the poor. Me, I want to see Saint Thelonious Monk!